A responsible person appointed by the Secretary of State to witness the signing of important documents and administers oaths. An impartial witness (the notary) ensures that the signers of documents are who they say they are and not impostors. The notary makes sure that signers have entered into agreements knowingly and willingly. 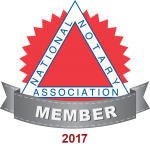 How does a Notary identifies a signer? Generally, the Notary will ask to see a current identification document that has a photograph, physical description and a signature. A driver’s license, US Military ID (issued within the last 5 years) or current passport. If none of the above-mentioned identification is available, two additional persons who do have one of the above documents may be present who will swear to the signer’s identity. Does notarization mean that a document is “true” or “legal”? No. Notaries are not responsible for the accuracy or legality of documents they notarize. Notaries certify the identity of signers. The signers are responsible for the content of the documents. MFC-8810DW High-Speed Laser All-in-One with Advanced Duplex and Wireless Networking Fast printing, copying and scanning. Produces professional black & white output at impressive print, copy and scanning speeds of up to 40 pages per minute.